Connect researchers to your journals with ease. BrowZine is the ideal tool for leveraging your most expensive resource – your electronic serials collection. 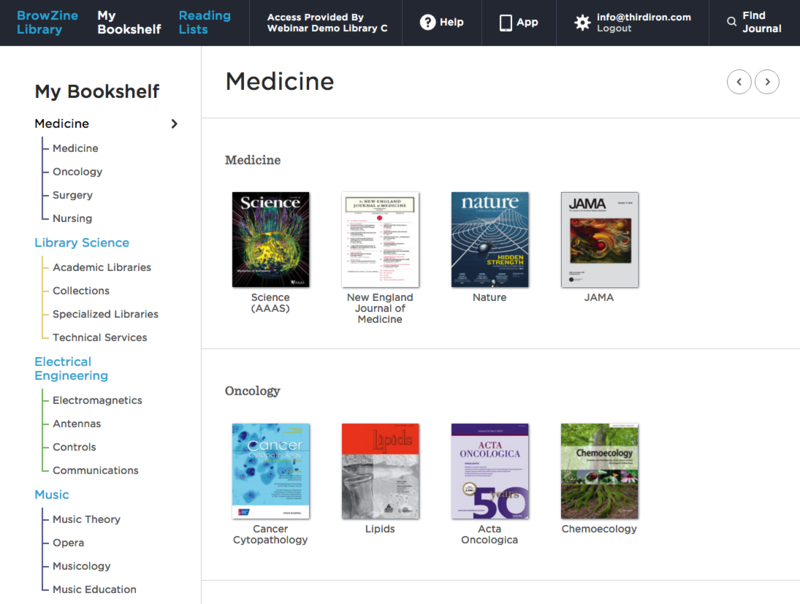 Present your collection in a streamlined user interface with personalization tools for researchers. With customized collections accessible on the web and mobile devices, BrowZine makes your journals more user-friendly than ever before. Your library has limited space for a large, print, journal reading room and you serve a distributed network of researchers. 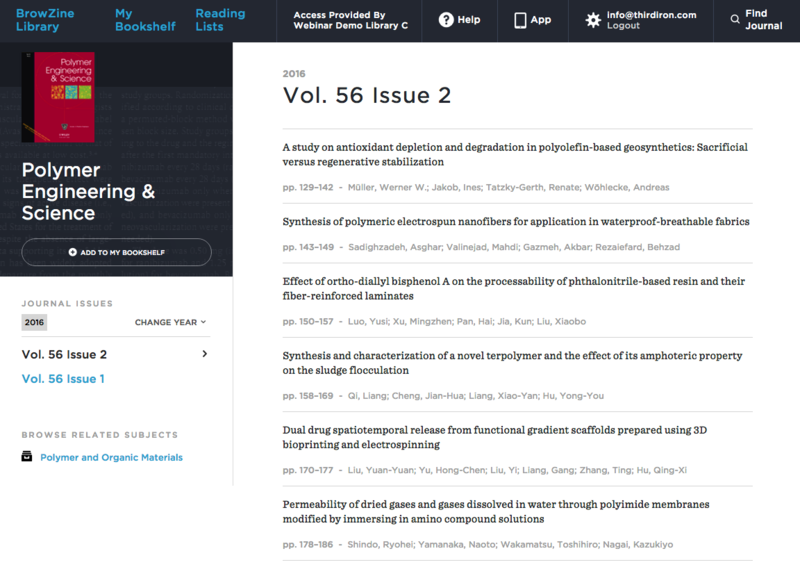 BrowZine provides the serendipitous browsing and reading experience your researchers need to keep up to date, make informed decisions, and be inspired to discover the next breakthrough in their field. Traditional A-Z systems provide an important function in presenting available content to your users. In fact, the knowledge base that powers that A-Z is the same engine that powers BrowZine. However, BrowZine dramatically improves the experience with a focus on user needs and expectations. We provide a simple, predictive search for looking up titles and journal subject categories from our custom taxonomy of over 1,200 terms, based on Library of Congress subject headings. 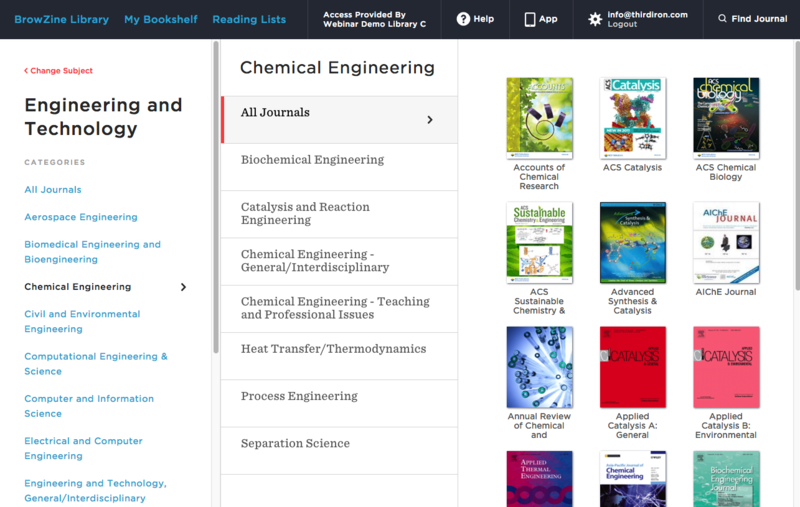 With a single search, users can see matching titles, subjects and even matching journals by ISSN. Select a title to go straight to the current table of contents . Select a subject to see a graphical representation of your collection in that area. BrowZine supports hundreds of publishers and tens of thousands of titles. 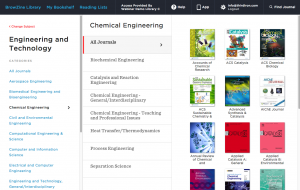 Researchers can rapidly familiarize themselves with your collection and sort titles by Scimago Journal Rank for insights into the top journals in their field. 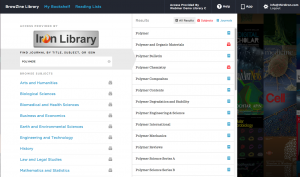 BrowZine offers durable linking so that you can guide researchers to specific subject areas. Feature top journals with durable links to the most current issue. Curate lists of journals to completely customize your users’ experience. Researchers have titles that they frequently consult to stay up to date in their field. These typically represent a fraction of the library’s overall holdings. BrowZine makes it easy to build this customized collection with My Bookshelf. Give your researchers one-click access to their favorite titles along with alerting features that notify them when a new issue has been published. BrowZine provides a streamlined current awareness experience that is easy to control. Additionally, with BrowZine Accounts, users can access My Bookshelf on their iOS or Android devices and enjoy seamless syncing across web, tablet, and mobile. Today’s researchers move from one screen to another throughout the day. BrowZine keeps up with them and keeps them up to date by supporting researcher workflows. Further, BrowZine on mobile provides a simple and straightforward way to read PDF’s offline and send those documents to popular bibliographic management systems like Endnote, Mendeley, Refworks and Zotero. Getting started with BrowZine is easy. BrowZine automatically syncs with most A-Z systems and Knowledgebases so that you can continue to maintain your holdings data in a single place. BrowZine supports popular remote authentication, making it easy to ensure authenticated access to your journals. Don’t have a remote authentication solution? Third Iron is also an Open Athens reseller and administrator. We are happy to work with your company to find the best solution for you to enable better access to your content. BrowZine is used at nearly 525 top research universities, hospitals, and corporations in 24 countries around the world including all of the Ivy League Universities and the Top 10 Medical schools in the United States. Researchers can port their BrowZine Accounts from one library or information center to another, ensuring a smooth transition from their former organization. Try our free sample library to get started and then contact us to learn more about bringing BrowZine to your company. Our experienced team will arrange a free webinar and trial of the service and share best practices from other organizations on how they integrated BrowZine into their researchers’ workflow.